A week before the finals of the 2013 Pinoy K-pop Star, 18-year-old Kristine Bernadette Solis was suffering from pharyngitis, or inflammation of the throat, that she was unable to practice her song "Can't Let You Go" by Seo Young Eun, an original soundtrack for the hit drama "49 Days." What she could only do was listen to the song over and over. She was only able to practice her piece the night before the finals. Despite this, Solis showed her winning combination of star quality and talent and was crowned as winner of the 2013 Pinoy K-pop Star, besting eight other finalists. Solis told Bulletin Entertainment that up to now, she couldn't believe that she won. Placing second to Solis is Sheila Mae Eunice Oña who sang Ailee's "I Will Show You" while Anna Jean Fernandez won the popularity award. Solis grew up in Saudi Arabia where her mom and dad are based. She said she really loves singing. In Saudi Arabia, she joined singing contests. She came back to the Philippines when she was 15 to go to college. She is currently enrolled as a Pre-Dentistry course student at Centro Escolar University (CEU). Solis said she got her singing talent from her dad, who is a singer and guitarist. Her sister plays the violin. She added that her favorite K-pop acts are Miss A and BoA. "My dream is to pursue my singing career," said Solis while at the same time finish her Dentistry course. The Philippine leg of the K-pop Star search, held last July 5, drew 28 entries and was part of the second anniversary celebration of the Korean Cultural Center in the Philippines (KCC). The panel of judges was headed by Hwang Seong-un, director of the KCC in the Philippines, together with Kim Yoon-sik, director of the Korea Copyright Commission; Ida Henares, founder of the Talent Development and Management Department of GMA Television Network; and Chesca Tan, marketing associate of Astroplus. Pinoy pop group Down to Mars, the country's representative to the Yeosu Expo in 2012, performed in the event. The Pinoy K-pop Star was supported by K-Pub and Astroplus. Solis will have the chance to represent the Philippines in the K-Pop World Festival in Korea through the selection method prescribed by the organizers. According to the KCC, the aggregate points garnered from YouTube hits, homepage votes and from the panel of judges will determine if the regional leg winner gets a chance to represent his/her home country on the global stage. 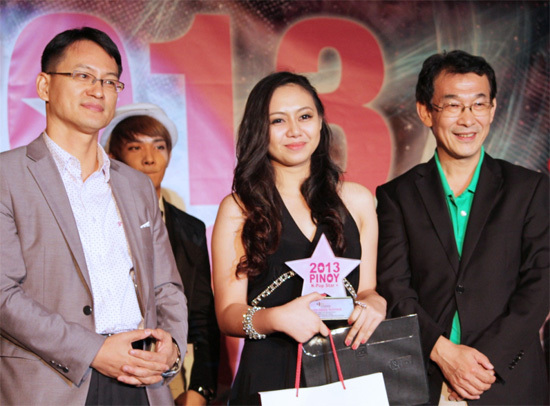 In 2011, Karla Carreon of the Philippines won in the vocal category in the first K-pop World Festival. Carreon was the first Pinoy K-pop star winner. Solis said she and Carreon are friends and were even competitors in singing contests in Saudi Arabia. The 2013 K-Pop World Festival will be held on Oct. 20 in Changwon, South Gyeongsang Province in Korea. The 15 contestants chosen from the regional legs will be mentored by K-pop stars and entertainment agencies for the final round of competitions. Last year, 37 teams from 33 countries participated in the 2012 K-pop World Festival. From them, 15 were chosen to advance to the final round. The invited K-pop groups were TVXQ, Secret, MBLAQ, FT Island, BAP, A Pink and Offroad. The K-Pop World Festival is organized by Korea's Ministry of Culture, Sports and Tourism, Changwon City and Korea Broadcasting System (KBS) and is supported by the Ministry of Foreign Affairs of South Korea. Besides the Pinoy K-Pop Star, the Korean Cultural Center in the Philippines will also hold a Culture Caravan at the University of the Philippines (UP) on July 13; a Korea Night on July 19 at the SM Centerstage, Mall of Asia; the 50 Years of Korean Contemporary Printmaking Exhibit at the Metropolitan Museum from August 1-23; and the Hangeul Ornaments Exhibit at the Korean Cultural Center from August 16 onwards. The Korean Cultural Center in the Philippines was established last July 19, 2011 and is offering a variety of programs especially designed for the Filipino market, in response to the growing interest of the locals to Korean culture.